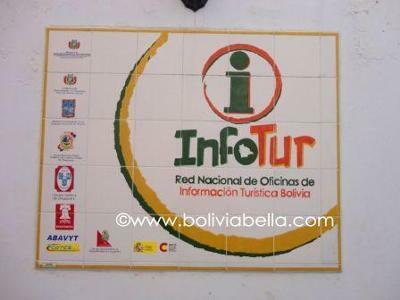 INFORTUR is a growing national network of tourist information centers in major cities and popular tourist attractions throughout Bolivia. Infotur Sucre is run by the Tourism Unit of the Chuquisaca State Government. 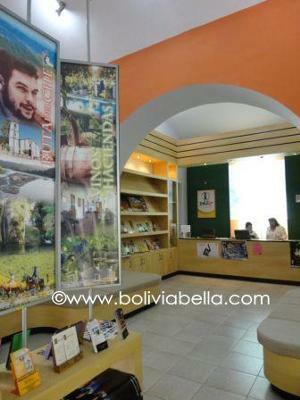 The large and modern Infotur office is filled with brochures, maps, guides and other information about tourism all over the department (state) of Chuquisaca and the city of Sucre. There is also lots of comfortable seating space where you are welcome to sit and browse for a while. You'll also find the POLICIA TURISTICA (Tourist Police) in the Infotur office. The tourist police are responsible for ensuring the safety of tourists and keeping crimes against tourists and Sucre's tourist attractions in check.